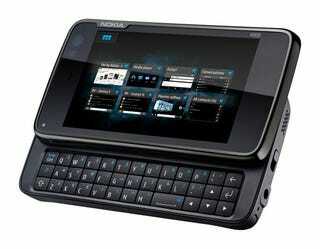 There's been a lot of talk about the N900 Maemo "tablet", especially about how it looks suspiciously like a phone. And even if Nokia (inexplicably) plays it down in their now-official announcement, that's exactly what it is: an amazing-looking handset. Beyond that Maemo Linux OS we've been begging Nokia to bring to phones for the better part of a year, the N900 is, as Nokia handsets tend to be nowadays, a healthy piece of hardware. It's got a 3.5-inch resistive WVGA screen, slide-out QWERTY keyboard, an ARM Cortex 8 processor, and 1GB 256MB of RAM, and is crammed with 32GB of internal memory with a MicroSD slot for expansion, GPS, an FM transmitter, a 5-megapixel camera, a 3.5mm jack and a gajillion-band cellular radio, including, crucially, support for T-Mobile's 1700MHz slice of the spectrum. Since Maemo is based on Debian Linux, the app selection should be interesting. Stock, the N900 will ship with Firefox (Fennec, I assume) and Flash support and a panel-based multitasking system, as well as tight VoIP integration and near-total video and audio codec support.